In post-Soviet Russia, dogma hit karma! 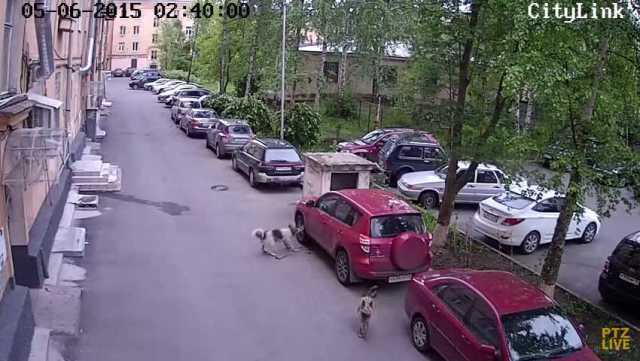 A car-owner in Petrozavodsk must have parked too close to Laika's favorite fire hydrant, prompting the peeved pooch to go full Red Army on the red vehicle. A 10:00 minute-long video posted on YouTube by ViralHog appears to be an outtake from a security camera though the quality is better than one might expect. The video is time-stamped, and although it's 2:40pm in the afternoon the residential street is deserted... except for a couple of dogs. The pair of mutts quickly select their target (a red Toyota Matrix or Pontiac Vibe) and while the calico canine begins to vigorously attack the vehicle's left front wheel well, the other dog moves out of the scene, presumably to stand lookout.